The promontory of Siccar Point is on a rocky and wild coastline just a few miles south of Dunbar, and is described as the most important geological site in the world. 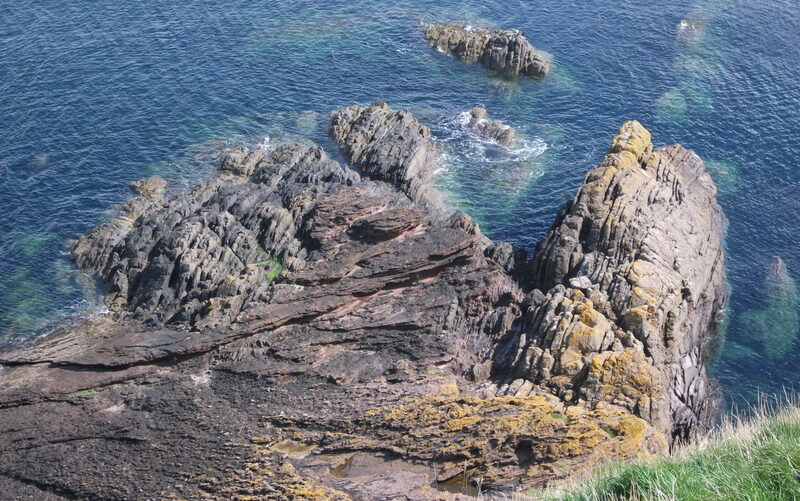 The site demonstrates an unconformity between two sets of sedimentary strata and was used by James Hutton to support his world-shaking ideas of geological time and natural processes. We will visit Old Red Sandstone exposures at Pease Bay before walking out to Siccar Point over a grassy field. Aimed at new EGS members but open to all. Siccar Point, described as the most important geological site in the world, demonstrates an unconformity between two sets of sedimentary strata and was used by James Hutton to support his world-shaking ideas of geological time and natural processes. We will visit Old Red Sandstone exposures at Pease Bay before walking out to Siccar Point over a grassy field. This introductory excursion is aimed at new EGS members but it is open to all. Milton Road, near junction with Park Avenue. Car park at the entrance to the Pease Bay Holiday Park, Cockburnspath TD13 5YP. Walk along Pease Bay to exposures at the west end of the beach. Walk from Siccar Point car park to Siccar Point. Rough paths and grassy fields. Steep grassy slope above Siccar Point, which can be muddy and dangerous when wet. Participants should only descend to Siccar Point if they are physically fit, properly equipped with walking boots and the conditions are suitable: dry grass, not windy. Toilets and shop at Pease Bay. Lothian Geology – an Excursion Guide (Edinburgh Geological Society, 1996), pp 146-151.